Many processes and methodologies include a post project review phase, where projects can be analyzed and reviewed for successes, failures and opportunities for improvement that would benefit future projects. Enterprise Architect has a flexible Team Review facility that allows any part of a model or practice to be reviewed, including things such as naming conventions, modeling style, modeling language usage and correctness and any other dimension of a project. This facility is typically used during the execution of a project such as at important milestones or every week or month, and can also be used at the end of a project to gain value insights into how to improve future projects. There is the ability to dynamically reference any part of the models, such as elements, Packages and diagrams and these can be conveniently added to the review by dragging and dropping them from the Project Browser. 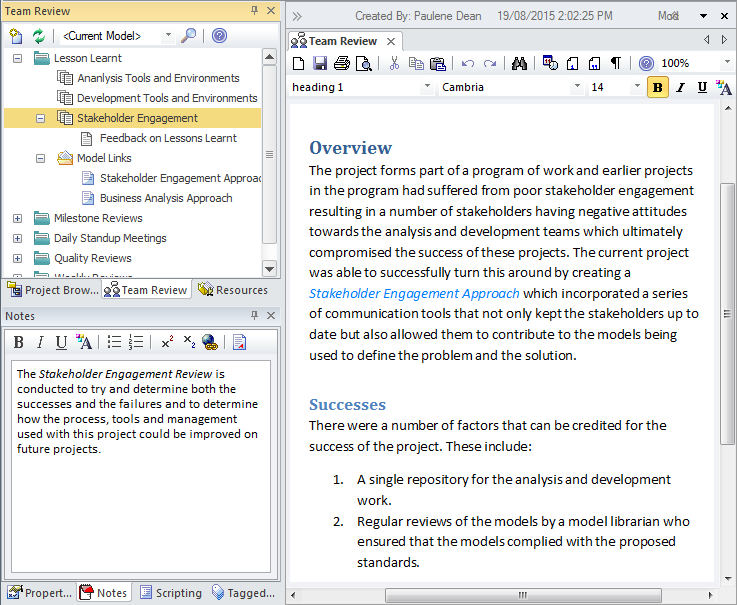 There is a flexible built-in word processor where text can be created and formatted, making it available right inside the modeling environment. A Document Artifact can be used as an alternative to using the Team Review facility for recording the Lessons Learnt. A template could be specified for the document and the details of the session recorded into the Document. Other model elements that represent successes, failures or have some importance to the lessons can be dragged into the document as links. The Team Review facility is a powerful tool for assisting with a Lessons learned session regardless of the format of the session. Creating and recording a Lessons Learnt session directly in the model is useful as it allows a reviewer to include links which reference parts of the repository such as Requirements or Components. There is a word processor document available that can be used to describe aspects of the review and a template can be used to define the structure of the document. Any number of categories can be set up for the sessions and topics and documents can be added to these to form a hierarchy. Resources such as XML files and Images can be added under the Category, Topic or Document. A new Lessons Learnt Team Review could be set up at important project milestones. The Calendar provides a way to record and present important temporal information such as events and meetings in calendar format. Lesson Learned sessions can be entered into the Calendar and setup as recurring if needed. Event subtypes can be configured to add Lessons Learned as a Meeting Type. Model Mail can be used to notify and remind people of a Lesson Learned session and to notify them after the session about outcomes and decisions and required actions. Links to model elements and diagrams, matrices, team reviews and a variety of other items can be added.